In 2012, Fortune ranked IBM the No. 2 largest U.S. firm in terms of number of employees (435,000 worldwide), the No. 4 largest in terms of market capitalization, the No. 9 most profitable, and the No. 19 largest firm in terms of revenue. Globally, the company was ranked the No. 31 largest in terms of revenue by Forbes for 2011. Other rankings for 2011/2012 include No. 1 company for leaders (Fortune), No. 1 green company worldwide (Newsweek), No. 2 best global brand (Interbrand), No. 2 most respected company (Barron's), No. 5 most admired company (Fortune), and No. 18 most innovative company (Fast Company). IBM has been present in India since 1992. IBM India's solutions and services span all major industries including financial services, healthcare, government, automotive, telecommunications and education, among others. As a trusted partner with wide-ranging service capabilities, IBM helps clients transform and succeed in challenging circumstances. The diversity and breadth of the entire IBM portfolio of research, consulting, solutions, services, systems and software, uniquely distinguishes IBM India from other companies in the industry. IBM has been expanding its footprint in India - and has a presence in over 200 cities and towns across the country - either directly or through its strong business partner network. IBM India has clearly established itself as one of the leaders in the Indian Information Technology (IT) Industry - and continues to transform itself to align with global markets and geographies to grow this leadership position. Widely recognized as an employer of choice, IBM holds numerous awards for its industry- leading employment practices and policies. The profile involves providing support on networking and Intranet framework maintenance on IBM data Management products, Server Support Modules, Server Maintenance Modules. § Technical and HR round. 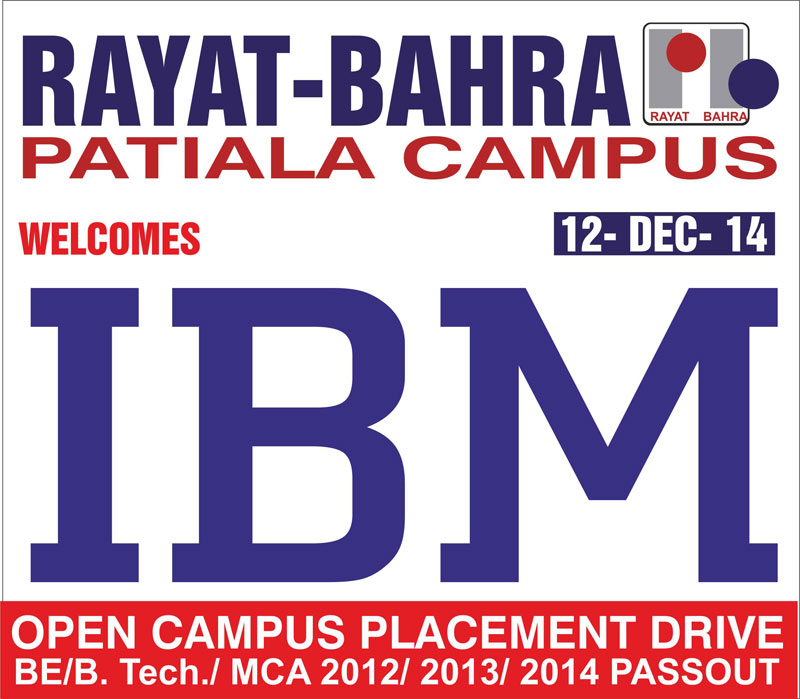 All the interested and eligible students are required to register on the link given below by 8th of December 2014.